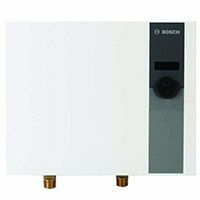 Gas and electric tankless (also known as "instantaneous" or "on-demand") hot water heaters for indoor and outdoor residential and commercial applications. 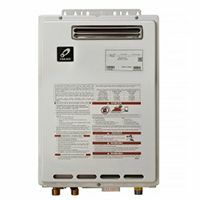 Condensing and non-condensing tankless water heaters in natural gas (NG) and propane (LP) options, for indoor or outdoor use. Whole-house and point of use (including mini-tank) electric tankless water heaters in 120V, 208V and 240V power options. A tankless, or “on-demand” water heater is a space and energy-saving alternative to storage (tank-type) gas and electric water heaters. Tankless water heaters only turn on when the hot water tap is opened and flow is detected. Since there’s no need to keep a tank full of water heated at all times, no energy is wasted - this makes tankless heaters extremely energy efficient and allows for the installation to pay off in a matter of a few years. Gas tankless water heaters operate using either natural gas or propane as a fuel. Installed indoors, they will require a flue pipe to vent the combustion gases outdoors and often require a separate pipe for air supply when installed in boiler rooms, closets and other confined spaces. When installed outdoors (in warm climates only), no vent piping is necessary. Electric tankless water heaters operate using electricity from the main power supply. They are usually lightweight, compact and unlike gas TWH’s, do not require any venting. Initial cost for gas TWH is nearly always higher due to the higher cost of the unit and the venting installation. Operating costs for gas TWH is nearly always lower than electric due to relatively low prices for natural/propane gas comparing to electricity. Ease of installation points go to electric since gas TWH requires venting and special considerations at high elevations. Hot water output will vary by the model, but gas TWH’s generally deliver much higher GPM flow necessary for larger dwellings and high-volume usage.